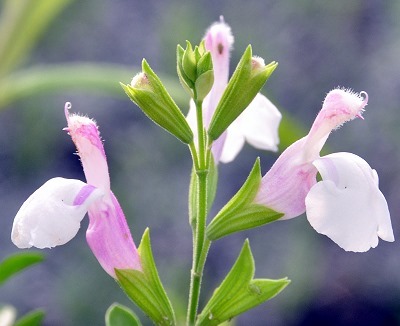 As you can see the flowers of Teresa's Texas Sage are a lovely white with pale pink blush. It makes a good addition to a summer moonlight garden. Other nice whites for this are Nutmeg Scented Geranium and Santa Barbara Daisy. Teresa's Texas Sage makes a great addition to our Edible Flower Herb Garden Six Pack. This plant is sometimes available in plug trays. These trays hold 128 of all the same plant. They are a great low cost way to fill a lot of space. Each cell is 3/4 of inch by an inch. Check here to see if Teresa's Texas Sage Plug Trays are available.